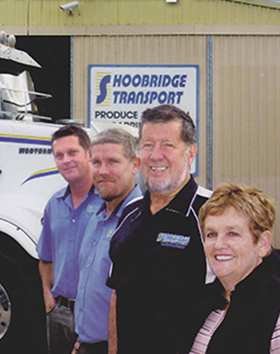 Shoobridge Transport , a family owned and operated company had its origins back in the 1970’s when banana growers Glen Shoobridge and Des Stafford purchased their first truck and began carrying their own produce to market. As other growers came on board and with an expanding fleet, transport quickly became the main priority. Originally “Shoobridge and Stafford”, the company is now owned by Glen and Gwenda Shoobridge and sons Barry (Basil) and Peter (Pedro). The business has grown significantly over the years and now employs over 60 dedicated local employees who are the “driving force” behind Shoobridge Transport. Today Shoobridge Transport operates a modern fleet of over 35 trucks in B Double, Semi Trailer, and Rigid configurations servicing a wide variety of clients in the food industry. From specialised temperature controlled distribution, linehaul interstate services, to storage and freight management, Shoobridge Transport is committed to servicing our customers requirements in both ambient and refrigerated, as well as general freight. At Shoobridge Transport, we ensure that our management team are able to provide the best possible management solutions for both the company and its employees. We provide training for our management team making sure they are up to date with the latest information and strategies to help Shoobridge Transport maintain their competitive edge in the transport industry.